Back in the good old days, automotive troubleshooting, diagnosing, and repair was (in my opinion) a pleasant and fairly straightforward process. Engines were accessible with space to work, & ignition consisted of simple rotors, distributor caps, and spark plugs. The distributor cap and rotor are used to provide a rotating current path to the spark plugs. They are manufactured out of a special plastic insulating material, designed to withstand both heat and high secondary ignition voltage. The inside surface of the distributor cap contains ridges to prevent the high voltage secondary current from crossing over to the wrong cylinder and resist carbon tracking. Secondary ignition current enters the distributor cap through an electrode placed in the center of the cap. Inside the distributor cap is a contact constructed of carbon material and is used to provide a current path between the center electrode and the distributor rotor. Electrodes are placed around the perimeter of the distributor cap, corresponding with the number of cylinders the engine contains. The electrodes are spaced far enough apart to prevent arc over and reduce carbon tracking. As the distributor shaft rotates, the rotor moves past each electrode, in sequence, providing a current path to each spark plug. The rotor does not touch the electrode but passes by a specified distance from the electrode. The secondary current is required to bridge the gap between the rotor and the electrode. Deterioration of the distributor cap electrodes or the rotor tip, can cause the rotor gap to become excessive. This could result in high secondary voltage requirements and can affect engine performance. 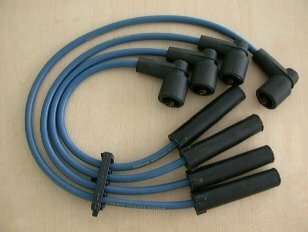 The ignition cables are used to carry high voltage current to the spark plugs. They are usually constructed with a silicone outer layer and a carbon type core. Insulation material is placed between the outer layer and the carbon conductor. Terminals are placed at either end to connect to the spark plug and the distributor cap electrodes. 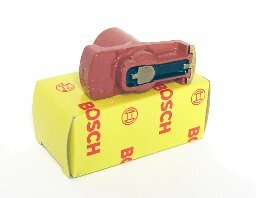 Special molded silicone boots provide insulation for the terminals at the plug wire ends. Spark plug wires are designed to suppress electrical noise generated by high secondary voltages. For this reason, spark plug wires have a higher resistance compared to conventional wiring. The normal resistance reading of most plug wires is about 3,000 Ohms per foot. Spark plug wires can be easily damaged by improper handling, especially when removing plug wires for engine repair or spark plug replacement. The carbon material inside the plug wire can be easily damaged and create an open circuit. Care should be taken when disconnecting plug wires from the spark plugs during an auto repair job. The spark plug boots can be easily pierced by using improper procedures or tools. When the plug boot becomes pierced, an alternate ground path is created for secondary ignition current. When the engine is under a load, the resistance of the secondary ignition system rises due to conditions inside the combustion chamber. Electricity always takes the path of least resistance, so the hole in the plug boot becomes easier ground path than the spark plug. The result is an engine miss under load. Care should be taken to route spark plug wires away from heat and chafed points. Damaged or broken plug wire looms should always be replaced during an auto repair job. The spark plug delivers spark for ignition of the air/fuel mixture, directly into the combustion chamber. Spark plugs are designed to withstand the heat of combustion, along with pressures developed inside the cylinder. The typical spark plug consists of a center electrode mounted in a ceramic shell. The shell provides insulation between the center electrode and the outer electrode. The outer electrode of the spark plug is attached to the threaded metal outer housing, located at the tip of the spark plug. Cooling of the spark plug is provided by contact with the metal housing and the cylinder head. Spark plugs are especially designed to match the application they are intended for. Tip design and heat range are tailored to meet individual vehicle operating conditions and ignition system design. Heat range is determined by the length of the ceramic insulator and the center electrode of the spark plug. A spark plug with a cold heat range will use a shorter center electrode, with a shorter insulator and will dissipate heat much more quickly than a hot spark plug. Cold heat range spark plugs are generally used in engines that operate at high speeds consistently. On the other hand, a hot heat range spark plug will have a longer center electrode and ceramic insulator and also dissipate heat more slowly than a cold plug. Hot heat range spark plugs are generally used on engines that experience more stop and go driving or low speed operation. Most automotive engines today use spark plugs that are specifically designed for the car they are installed in. To avoid engine damage, the recommended spark plug should always be used – refer to an auto repair manual for the type of plug needed for your car.